It takes about 60,000 bees to travel up to 55,000 miles and visiting more than 2 million flowers, to gather enough nectar to make one pound of honey. Raw honey is a truly remarkable substance and a great product with amazing benefits you should include in your diet. Beekeepers have acres of large bee colonies where they collect raw honey. It makes them able to meet the consumption demands of the consumers. Raw honey is one of the best sweeteners. It is unburdened by processing and needs no additives to achieve its sweetness. It is 38 percent fructose and 31 percent glucose. Bees secrete the honey as a form of food to their use during the winter periods when other food sources are low. A beehive has one queen, a few hundred males, and about forty thousand female workers. There are many types of honey, and its taste is determined by the flower the nectar came from. Raw honey is got from most modern bee hives by pulling out a wooden slide. It has a comb structure built into it. The structure is used by the bees to store the honey. All one has to do is drain and reinsert it. The colony remains intact, only the extra honey is taken. A lot of people love to have honey with their breakfast, but other like it for its medical properties. The foods we eat are either alkaline or acidic. So, much of our food, mostly processed food has a high degree of acidity. We need other foods that are salty to balance things up. High acid level is not good for our bodies. When Raw Manuka Honey is digested, it becomes alkaline and balances out the pH level to a more natural level. Therefore, honey works as an excellent antacid. Raw honey is a good source of enzymes and can substitute many sweeteners as the blend of sugar, trace enzymes, minerals, vitamins, and amino acids is quite unlike any other sweetener on the planet. When one looks at the “Nutrition Facts” label of honey, one would think it is nothing but carbohydrates. But there is more than just sugar in honey. 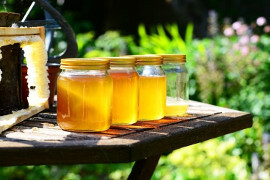 Raw honey should be seen as the living food. We need enzymes for our bodies to function properly. The three classes of enzymes include digestive, metabolic, and food enzymes. Enzymes are the catalysts that break carbohydrates down to simple sugars. They work on proteins to break it down to simple amino acids. It’s a simple form which the body able to use them. Other enzymes then turn these fuels into building blocks to produce energy for the body. Taking honey in its natural form preserves these enzymes. For thousands of years, raw honey has been considered as a great healthy food supplement and an excellent home remedy for a range of diseases. Honey is more than a natural sweetener since it gives a natural defense against many body ailments. It’s time to catch up on what you have been missing by grabbing your raw honey today.